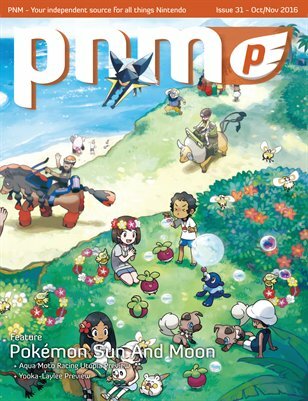 Our 31st issue is chalk full of Pokemon goodness in celebration of Pokemon Sun/Moon. Our cover story is all about Pokemon Sun and Moon as we detail the key new features and differences in these new entries. The latest character profile is also on the first professor in the series, Professor Oak. We also got to preview two new games coming to the Wii U with Aqua Moto Racing Utopia and Yooka-Laylee. Both games are currently without release dates but we got to play a good portion of each to give you our impressions. Matt also takes a look back at Wii Music and discusses the game’s key successes and failures. We also have part two of our Metroid 30th Anniversary celebration where we discuss Metroid Prime Pinball, Hunters, Prime 2, Prime 3, Hunters, and Fusion. Be sure to check out some amazing concept art for Lady Layton as well as our latest reviews and new fan art! Happy Gaming!